While the M4/M4A1 81mm mortar carrier served a vital need at battalion level in armored infantry units, it was recognized that it suffered from having the mortar oriented to fire backwards and not forwards. While some units such as the 2nd Armored Division corrected this, the Army moved to correct all of the flaws with a new vehicle. The result was the M21, which was based on the larger M3 body and not the shorter M2. It retained the rear door for use in reloading of ammunition (two fold-down seats blocked easy access for personnel) and added larger ammo racks. A pintle mount for a .50 caliber M2 machine gun was added just behind the mortar. Other late model features such as the removable combat lights and the side and rear stowage racks were added to the vehicle. But as nearly 1,200 M4s had been built, there was not a great need for the new vehicle and production was terminated after only 110 were built. 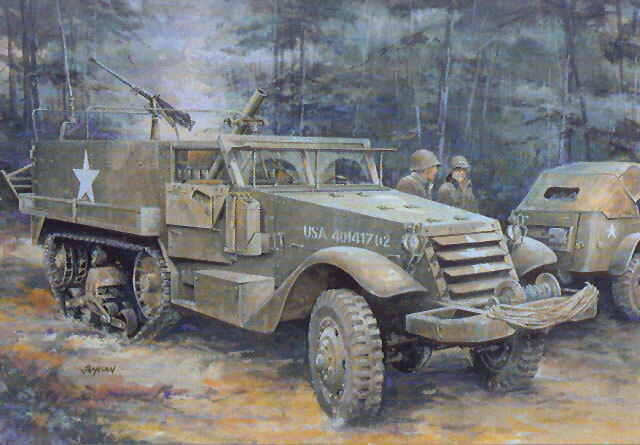 Each battalion headquarters in tank and armored infantry battalions had a platoon of three mortar carriers and a command halftrack, so there were at least 18 to 27 of these vehicles in an armored division. DML has now added this kit to their line to compliment the earlier M4 kit (No. 6361)It uses the M2/M2A1 chassis components verbatim but now adds the modified M3 type body with ammunition racks, the rear end with door, and the mortar itself. The bulk of the kit is identical to all other DML halftrack kits. Four sprues provide the parts for the chassis and drive train, including a complete White engine and transmission. While the hood is molded in one piece, DML has notched the back side as well as the insides of the “cab” sides to permit easy cutting to open them up for display. The tires have caused a lot of controversy as DML molded them with a slight bulge to show underinflated tires under load; this has been a love/hate feature of the kit, but personally I think it is not as bad as some of the “boo birds” have claimed. To each his own on taste. The bogies and track runs are very impressive, as the idlers and drivers are “slide molded” with respectively thin details and openings. Each bogie assembly consists of 18 parts and is very petite; the mounting suspension provides five more with the track tension adjusters nicely portrayed. The tracks are very interesting: DML molded them in hard styrene plastic in two halves, cut in such a way that the “chain” plate drive tooth guides in the center are represented as they are found on the actual vehicle. Since the tracks were metal with rubber “endless belt” casings vulcanized onto them, this is a neat way to portray it. The model now comes with only one set of body panels for the rear body. But it also comes with the original M2/M3 cab which does not have slotted screws. While this is a minor glitch, a number of “boo birds” howled about it and DML did eventually provide a modified set of cab parts with the slots present. This cab is not provided with this kit, however. (I suspect ther reason was that the early molds had the water can racks molded in place whereas the corrected ones did not.) The model has the “civilian” style dashboard, so note that the instruments are a brushed aluminum color on preserved/restored vehicles and not the more common black with white numerals. The winch and roller each come with their own bumper and accouterments, and as the M21 had a winch (whereas the M4 did not) it comes with a section of nylon string and copper chain. As with the M4 the new body has the ammo lockers molded in place on the floor pan, but the molding is neatly done. However, all of the racks are full so it will take some work to show an “in action” version with some of the bomb stowage tubes missing. The well for mounting the mortar is present as are the covers for the well and the extra frame braces under the floor. The mortar consists of five styrene parts and a two-piece turned aluminum barrel with the “knob” fitting for the baseplate turned on the base section. This kit includes a complete set of 24 mines with separate etched brass pressure plates and carrying handles. They mount on the sides of the hull, or if the modeler finds this tedious a pair of racks molded with the mines in place are also included. The “ladder” type equipment stowage racks are provided as are the “luggage” racks for the rear of the hull, with an option to present them open or closed. The kit does provide a generic driver with tanker’s style jacket and helmet. Note he comes with his own seat cushion, but it’s not for use in this vehicle! Overall this adds another member of the M2/M3 family and leaves only the short-lived M13 and the M15/M15A1 to complete the American family of halftracks.